Twenty One Toys Inc. is a toy creation company that reimagines toys as tools to teach the key 21st Century skills: Empathy, Creativity, Collaborative Learning, Innovation and Problem Solving. 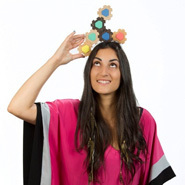 After studying Industrial Design at Carleton University, Ilana quickly realized she wanted to design toys. She recognized how important it was to do work that mattered and had a positive impact on her community, however she couldn’t find any socially-motivated design companies and didn’t think it was possible to be dedicated to a social mission and still make money. Over time, Ilana discovered the world of social enterprise which started her down a new and incredibly rewarding career path. From a design stint in London, to working at a start-up accelerator in Helsinki, Finland and then with the Centre for Social Innovation in Toronto, Ilana has had the opportunity to meet with many incredible organizations in Canada and abroad. She feels that it is especially exciting to see where Canada is going in the social enterprise realm. The first in a new set of toys is the award-winning CONNEXIONS™ TOY for Empathy & Creative Dialogue. Originally designed with the Canadian National Institute for the Blind to bridge the communication gap between visually impaired students and their sighted classmates, it is now used as a tool for emphatic learning and creative education for people of varying ages and abilities, in classrooms and boardrooms around the world. Beyond the major help that the Spin Master Innovation Fund financing and Futurpreneur Canada give us to carry the company forward, it’s humbling to be recognized for innovation by a major player in the toy space.